Viagra step aside. This here is youth in a bottle. I had to give in to this obviously fake cover. I think I need to rephrase my “no Photoshop here” rule into “no Photoshop by me here.” The cover is just too clean to be real. However, the product advertised within is real. The Masculine Water of Kladanj, Bosnia-Herzegovina has been around for ages. This mineral laced spring water purportedly acts upon the cardiovascular system in such way to increase potency. Whether or not this claim is based on any clinical research is uncertain. When consumed fresh from the spring the water also raises libido. Now this claim is correct but I doubt the water has anything to do with it. I’d attribute the phenomenon to mass psychosis and the presence of enterprising local prostitutes. Visit the Bosnia-Herzegovina tourism page for more information on how to get to the spring of this miraculous water. It may be cheaper than buying $20 blue pills from resellers. If you are unable to visit try to find this film about the pilgrimage to the source of Masculine Water. I’ve seen it as a kid and would love to watch it again. Mr. Vehbija Coralic is probably an imaginary character. Had he been real I wonder what he’d need the Masculine Water for anyway. This guy never had a girlfriend. I suppose it’s hard to engage in manual stimulation when the pressure is low. His two songs on this single are titled “At the Spring of my Youth” and “I Return to my Youth.” Pity that such a young man has lost his “youth” already. 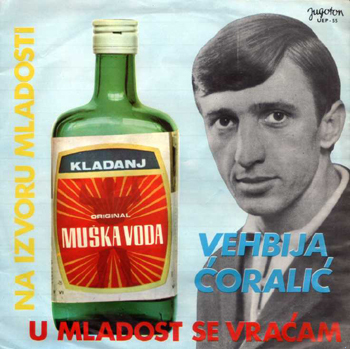 This entry was posted in Records and tagged Bad record covers, bosnia, masculine water, muska voda, vehbija coralic. Bookmark the permalink. One Response to "Masculine Water"
This is not a fake cover! And Vehbija Ćoralić is not imaginary character!